Western blot analysis of extracts from various cells expressing different activated tyrosine kinases, using Phospho-ALK (Tyr1586) Antibody (upper) or Phospho-Tyrosine mAb (P-Tyr-100) #9411 (lower). 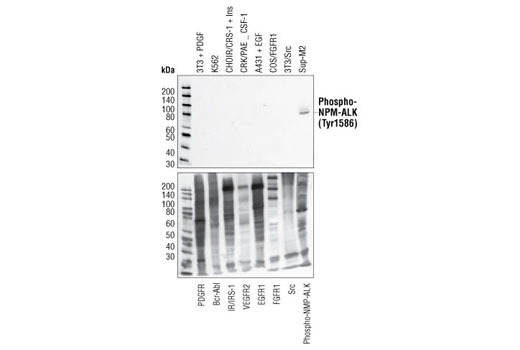 Phospho-ALK (Tyr1586) Antibody shows no cross-reactivity with other tyrosine-phosphorylated tyrosine kinases. Western blot analysis of extracts from Sup-M2 cells, using Phospho-ALK (Tyr1586) Antibody (A,B) or ALK Antibody (C,D). The phospho-specificity of the antibody was characterized by treating the membrane with calf intestinal alkaline phosphatase (CIP) (B,D) after western transfer. 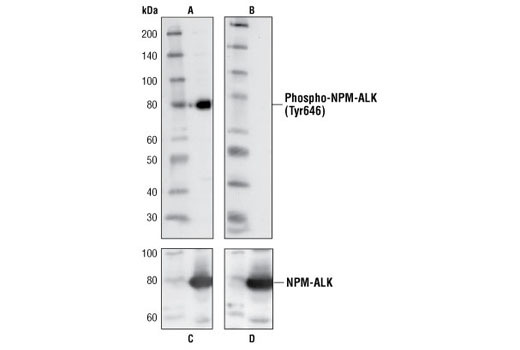 Phospho-ALK (Tyr1586) Antibody detects ALK only when phosphorylated at tyrosine 1586 (equivalent to Tyr646 of NPM-ALK). Polyclonal antibodies are produced by immunizing animals with a synthetic phosphopeptide corresponding to residues surrounding Tyr1586 of human ALK. Antibodies are purified by protein A and peptide affinity chromatography.